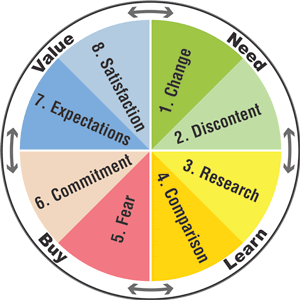 Customers go through eight predictable steps when making a buying decision. Today’s “digitally-educated” buyer’s first contact with a sales rep typically occurs in the “Learn” phase. The trouble is, a major portion of the buying process already has occurred without initial customer needs being explored and developed. Sellers meeting with a prospect for the first time must identify where they are in their buying process, and then back them up to “Need” phase to probe more deeply. That’s the reason for the bi-directional arrow in our buying process model. During the “Learn” phase customers research their buying criteria. Effective seller’s help customers clarify and expand their criteria requirements, thereby positioning themselves as the customer’s best choice during “Comparison stage” in the buying process. Ever had a major prospect suddenly go “silent” at the 11th hour? That’s the “Fear step,” where customers’ unresolved concerns can block a purchase. Sellers should anticipate these concerns and maintain communication with the prospect. Slow Down, Sell Faster! provides your sales team with a different point of view – a repeatable approach to working through the buying process. By slowing down the buyer conversation to better define needs, salespeople help customers move through the buying process faster, and with the odds in your favor. 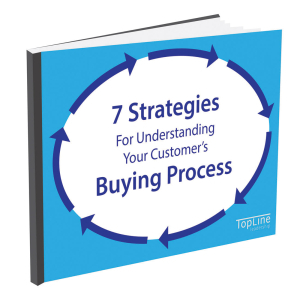 It is imperative that we have a sales process focused on the customer buying cycle. We’ve used the flexibility of the program to train the majority of our sales force on this powerful consultative selling methodology. We’ve measured outstanding results.